I first set my eyes on Sleeping Bear Dunes and the Leelanau Peninsula of Michigan on a crisp fall weekend in 2010. My California-living sister was visiting our home in Wisconsin for a few weeks, and we thought it was a great time for her to see my new life in Michigan (we were both Googlers - she was CA-based, I was Ann Arbor-based) and do some fall exploring to areas of the state I’d not yet visited. Her plans to ferry across Lake Michigan and start the weekend from Muskegon were foiled by crazy winds which canceled the ferry. Some frantic 4 am planning found her a last minute flight to Grand Rapids (seriously, she drove to the airport from the port, perfectly timed, and was on the plane for <$100 - total magic), a perfect launching point into Northern Mich. We hiked and wine/cider-tasted and shopped and adventured about, falling in love with every stop we made in each town. 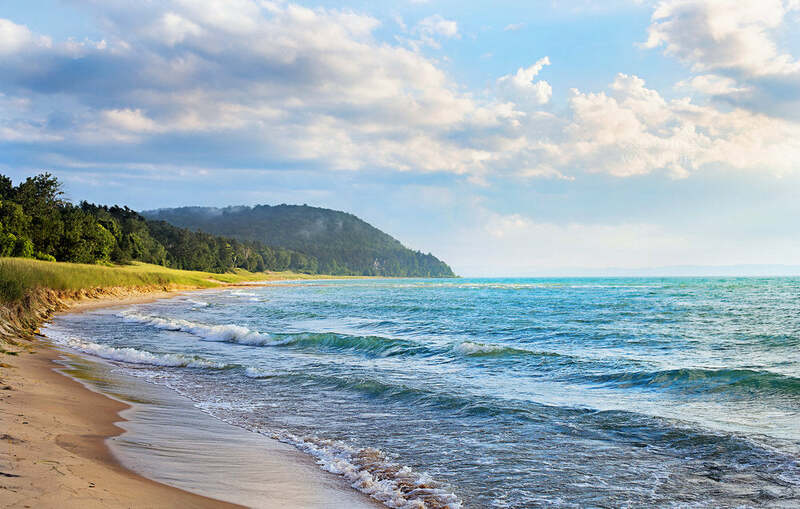 My fondness for this area was only amplified when I found the work of Briana Page, a photographer who lives in Northern Michigan and captures the essence of these areas in a way that rings true to how I remember and love them. Enjoy a taste of one of her favorite parts of the Peninsula, the Clay Cliffs Natural Area. Have you ever hopped in your car and taken a drive along M-22? As a year round resident of the Leelanau peninsula, this winding stretch of pavement is a part of my daily life. Sometimes it takes me to everyday tasks like grocery shopping or picking the kids up from school....but more often than not, it takes me to amazing destinations! Being a local landscape and 'up north life' photographer, I'm often asked by people visiting the area for pointers on "hidden gems" they can see during their stay. While there are plenty that come to mind, one of my favorite spots along this beautiful roadway is a gorgeous location that, to my surprise, many people say they have never heard of. I’d like to remedy that! The Clay Cliffs Natural Area is located directly along M-22 just a few miles north of Leland. This 104.5 acre plot of land, preserved by The Leelanau Conservancy (M22 donates 1% of their proceeds to this organization!! 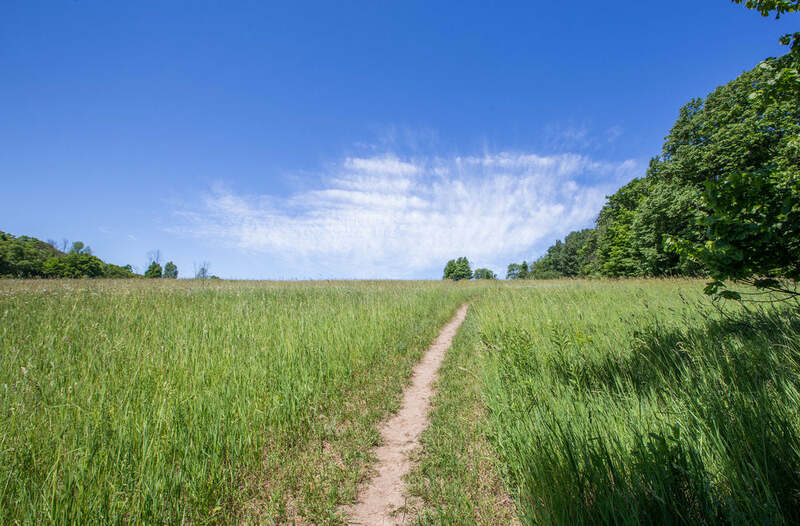 ), contains a 1.5 mile trail system with an overlook perched high above Lake Michigan. 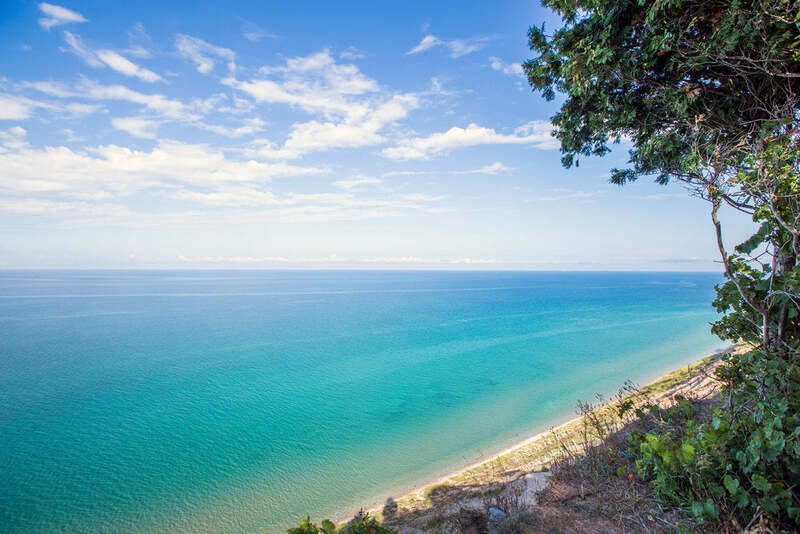 This natural area has saved 1,700 feet of shoreline on Lake Michigan as well as Lake Leelanau and its foot-worn paths feature forests of birch and poplar, meadows, and sweeping views of "The Big Lake". Intrigued? Well, lace up your hiking boots and let's get started! At the onset of the trail you find yourself underneath a canopy of silver poplars. There's something so mesmerizing about their wavy trunks and flashy leaves that just beckons you to explore! Just past the poplars are the remains of an old settlers homestead, the crumbling foundation still distinctly outlined. I always find myself stopping here and wondering about the people who built it and lived here--who were they? What brought them here? And why did they leave? The trail continues through hardwood forest until you climb a steep incline. Suddenly the trees part and you find yourself in a magical field of daisies and other wildflowers. As if this wasn’t enough, the best is yet to come. Push on another hundred yards and turn around to spot the glittering gem that is North Lake Leelanau! At the top of the meadow you enter a hardwood forest again, and I always marvel at the size of the trees up here. They are stout and solid, as any good trees would have to be standing high up on the edge of a lakeshore bluff that withstands almost constant wind and sometimes harsh weather. Though many trees fell during the devastating August 2, 2015 storm, I'm amazed at how many are still standing straight and true, without so much as a broken branch. I admire their tenacity! The absolute pinnacle of this hike is reaching the overlook, which stands sturdily 200 feet above the lakeshore. From this spot you have a bird’s eye view (literally--keep an eye out for the eagles who nest on the bluff!) of the sparkling blue waters of Lake Michigan. On the horizon you are easily able to spot the North and South Manitou islands, whose fog station and lighthouse are visible on clear days. And sometimes, if you're really lucky, you'll spot a freighter or two passing through the Manitou passage! Once you've had your fill of the majestic views of the lake and islands, the path continues almost entirely through forest. It twists and winds its way back to the parking lot, passing at one point through a small copse of birch trees. I have to admit that this hike is one of my favorites to take in the heat of summer because with the exception of the portion passing through the meadow, the trail is almost entirely shaded and provides cool relief from the sometimes broiling July and August sun. 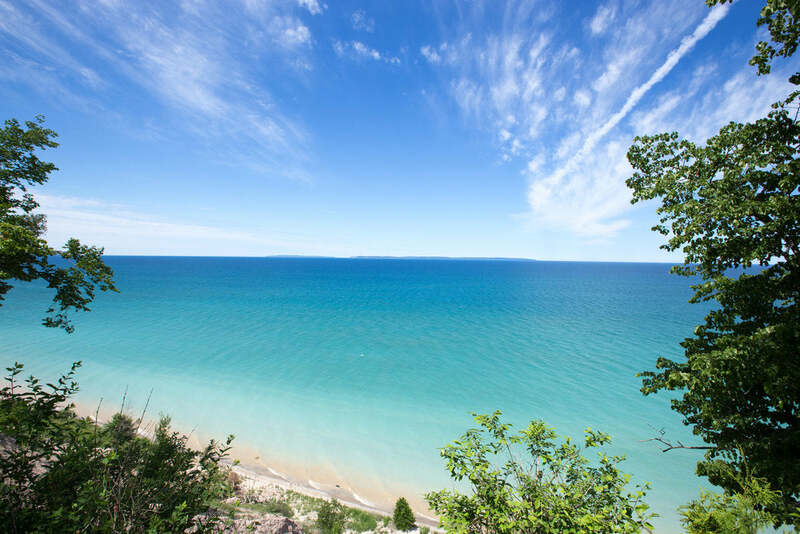 Once your hike is complete, I would highly suggest making the short drive down to Leland and dip your toes in the cool water of Lake Michigan at Van’s Beach. You won’t regret it! Briana also gave us some insight into the area with Leland/Clay Cliffs as our starting point. Closest major city & airport? 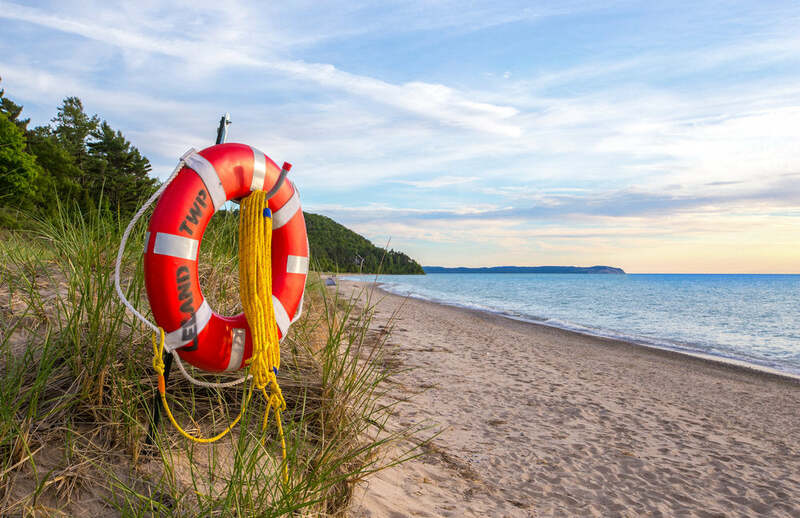 Traverse City is a 30-40 minute drive, and another city worth exploring. The closest airport is the Cherry Capital Airport. Other options include Grand Rapids (160 miles or ~160 miles), Detroit (280 miles), and Chicago (340 miles). Distance to nearest grocery store? The Leland Mercantile is ~3 miles from the Cliffs. Reasons the lake is important to you/your family?It's a peaceful place for us to go and unwind--we turn off our cell phones and connect with nature. We spend time together, happily searching for petoskey stones and beach glass. We use the lake to cool off on a hot summer day, or watch a storm roll across the turquoise blue water. We always know it's going to be a great day when we pile in the car and head to the lakeshore. Favorite lake activities/foods/traditions? We love to spend our days boating, playing at the beach and meeting up with friends. We plan sunset dinners with delicious sandwiches from the Village Cheese Shanty. What do you do when it rains? Cribbage and Euchre are favorites for a rainy day, along with local brews or wine (or even homemade beer courtesy of my husband!). A rainy day often sees us heading to a local watering hole--the Hop Lot being our favorite! Where to get a fish fry? Get the Cod, Smelt or Perch beer battered fish Kone at Knot Just a Bar - you won't regret it! Leelanau Cellars is conveniently next door and the restaurant and winery overlook beautiful Omena Bay.